Are Grenade Carb Killa Protein Bars Keto Friendly? At the time of writing this post I’ve been on the ketogenic diet for over five years and logged over 250 blood ketone tests in an effort to estimate the effects of food and ingredients on my ketosis, including those in Grenade Carb Killa protein bars. These "Grenade Carb Killa" bars are marketed to low carb dieters specifically, but do they miss the mark like Atkins, SimplyLite, and CarbRite that also market themselves as low carb? In this post, I'll evaluate Grenade Carb Killa bars, give them keto friendly grades, and see how they stack up against other low carb treats! Overall factors: These Grenade Carb Killa bars use large amounts of Maltitol which is a sugar alcohol with a glycemic index of 36. (more than half the GI of table sugar) I'm counting 50% of the Maltitol in these treats as net carbs for simplicity, which is low-balling since it's closer to about 67%. Each of these bars has over 10g of Maltitol, which is reflected in the net carb counts and grades below. Some of them have a small amount of Xylitol, but it's not worth adjusting the counts. They're also low in nutritional density and easy to overeat. You'll find all their flavors, nutrition facts, and ingredients here. Grenade Carb Killaprotein bars may be marketed towards us low carb dieters, but the heavy use of Maltitol in these bars is deceptive and makes these bars terrible for any low carb or keto diet. Too many companies are disguising blood-sugar elevating Maltitol, which is technically a sugar alcohol, so those who don't know better subtract it. Don't support these companies and their terrible products. Well what do you know? 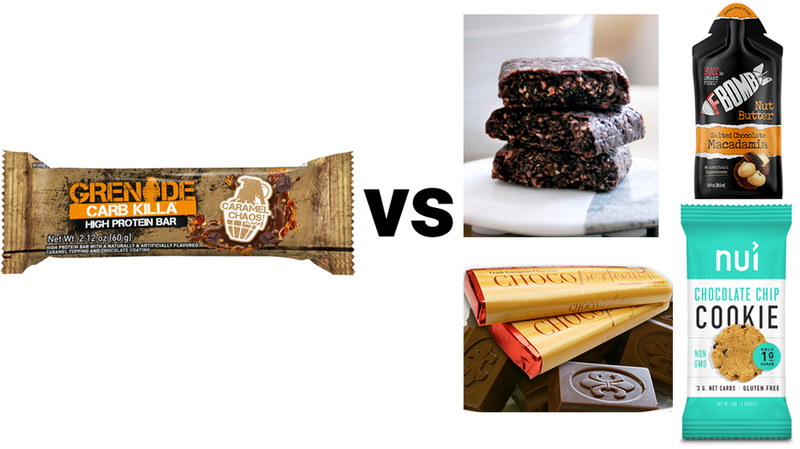 When comparing Grenade Carb Killa protein bars to the best keto-friendly treats out there by net carbs per 100 calories, which is the most consistent indicator of keto friendliness, there is no contest. So in conclusion I recommend going with more keto friendly sweet treats like ChocoPerfection, Nui cookies, Keto Bars, and F-Bomb pouches. My personal favorite is ChocoPerfection, it gets an A- keto friendly grade and an A+ in taste from me. Are Pure Protein Bars Keto Friendly? Are ChocZero Chocolate Squares Keto Friendly?